Session Chair should collect powerpoint presentations from his/her session presenters before the session, and bring a notebook computer that is compatible with VGA connector (if needed, session chair should bring an adapter). It is recommended that each session chair bring a laser pointer or presentation remote as UKC will not provide them. Each oral presenter should send his/her presentation file to his/her session chair before the session. Please use the file name as Symp_LastName_FirstName_DayofWeek_StartTime.pptx (e.g., CEA_Park_Brian_Thurs_1pm.pptx). Each poster presenter is required to display their poster as soon as possible (anytime after 2 pm on Wed., August 9) at the Poster Stand (note: each side of poster stand has two poster IDs, e.g., CEA-P1 and P2) located in the Independence Center Room. These posters should displayed until the end of the poster session on Friday, August 11, and should be removed no later than Noon on Saturday, August 12. As noted, each poster size should be up to 4-ft in width and up to 6-ft in length. In addition, each poster presenter should have submitted his/her 2-min speed talk slides to the speed talk organizer of his/her Symposium. 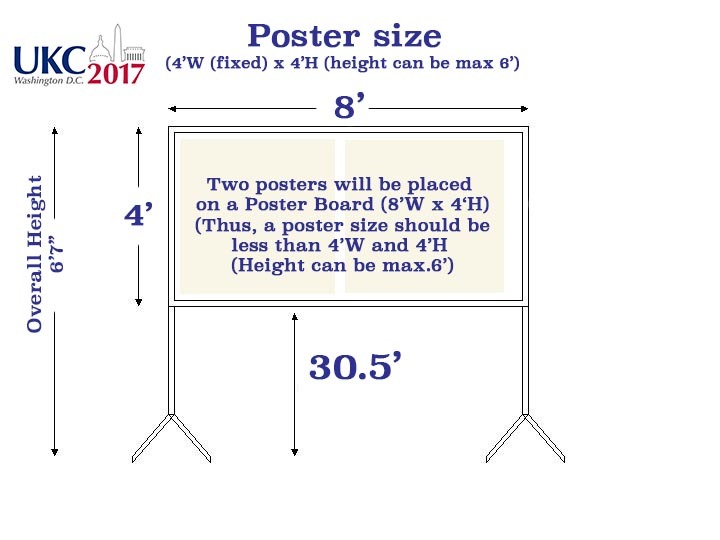 Each poster presenter should bring and post his/her own poster to UKC 2017 conference poster presentation room (TBD) between 3:20pm and 3:40pm on Friday, August 11, 2017. The poster size should be less than 4 ft wide and up to 6 ft long. The poster session starts 3:40pm ends 5:40pm. The organizer will provide push pins in the poster presentation room. Each poster should be removed at the end of the session. a. Presenter clearly articulates the motivation and significance of research. b. Presenter provides sufficient methodological details. c. Presenter provides comprehensive and completing overview of results. d. Presenter provides concise, evidence-based summary of key conclusions. a. Presenter offers engaging, organizing narrative with good pace, tone and gestures. b. Presenter has engaging, visually-appealing, and easy-to-interpret visual aids. c.Presenter is able to answer questions accurately and with good poise.